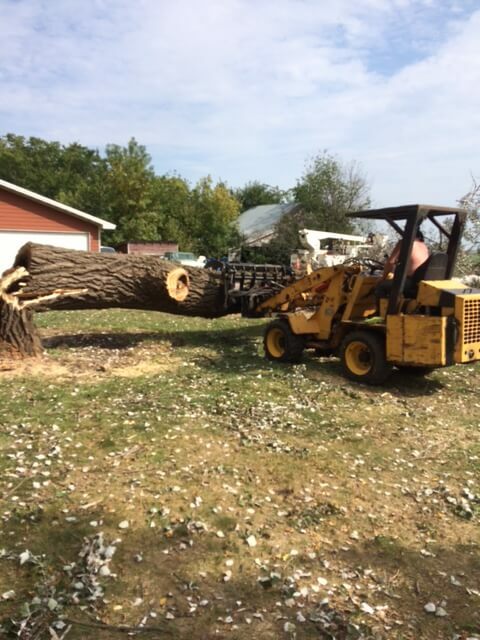 Wellman Tree Service provides professional residential and commercial tree service to the Sioux Falls, SD region, including Paulsen, Hartford, Dell Rapids, and southeast South Dakota. As a second-generation, locally-owned and operated business, we are staffed with licensed and insured arborists and equipped to handle complex jobs. We offer great customer service at competitive rates. Call us today for a FREE estimate. Tree removal– Our arborists will determine if ailing trees are salvageable or if removal is necessary. Trees may grow into sewer lines or foundations, or cause cracking in walkways or sidewalks, and must be removed without causing further damage. From full site-clearing, to thinning for grove management, we’re the tree experts. Call us today! Tree Trimming– Trimming is important for the health and longevity of your trees. We trim and clean up all tree debris on every job we do, either residential or commercial property, and offer regularly-scheduled tree-trimming maintenance. Call us for a free estimate today. Stump Grinding Services – Stump grinding is less invasive and more cost effective than stump removal. We provide quality stump grinding service our licensed subcontractor, Kelly. Call for more information. The Right Equipment- With 45’ and 70’ boom trucks, we specialize in large tree removal projects. Our state-of-art equipment ensures the job is completed safely and efficiently. Licensed and Insured Arborists– Homeowners often come to us for help when their trees have been damaged or become sick after an untrained contractor trims them. Our licensed and insured arborists are ‘tree doctors’, specially trained in tree care, maintenance and health issues. Storm Damage– At Wellman Tree Service, we are experts at storm damage removal. We provide emergency service and can check downed and injured trees and branches for damage and fix the problems immediately. Emergency Service – we believe in safety and we care about our customers. If you are facing an emergency tree situation, or are unsure if a tree near your home is safe, please call us immediately!